Yesterday, I wrote and posted a book review of SF/F author N.K. 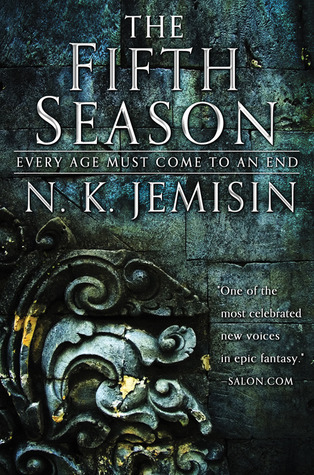 Jemisin’s Hugo award-winning novel The Fifth Season, both here on my blog and on Amazon (considering Goodreads as well). I then posted links of my review on twitter and in a private writer’s group on Facebook. 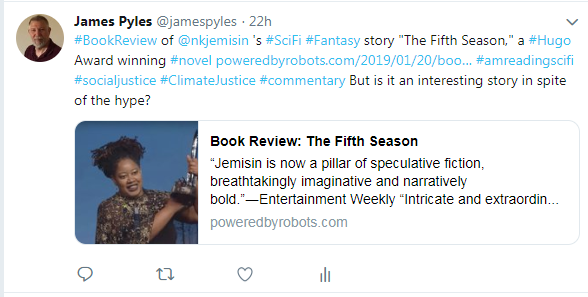 As you can see by the accompanying screenshot, I included Ms. Jemisin’s twitter “handle” in the body of my message in case she might want to read the review (and what author doesn’t want to read reviews of their books?). As an aside, before someone mentions it, I suppose I could be accused of “trolling” Jemisin…except I wasn’t. All I did was put @nkjemisin into the body of my tweet which also contained a link to my review of her novel. If I had put her handle as the very first word in the tweet, it would have gone straight to her and it would not have appeared in my twitter feed. I didn’t do that. I wasn’t exclusively “aiming” my tweet at her, though I certainly wouldn’t have minded if she saw it and read the review. I suppose she could have taken it the wrong way. I popped over to her twitter account just for the heck of it and gave it a brief read. I don’t recall the specific content. I was just curious. This morning, I decided to post another tweet referencing my review. I do this several times in twitter since folks might miss it the first time or two. I decided to include Jemisin’s twitter name once more, and out of curiosity, visited her twitter account again. Lo and behold, I was blocked. What the heck? What happened in the last 22 hours or so?